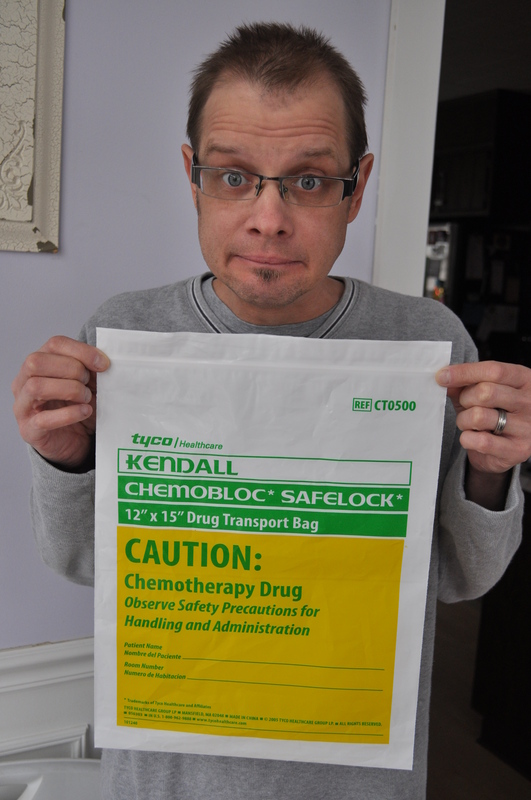 Since I last wrote, Jody had his six-month post-transplant bronchoscopy. In case you forget, this is a procedure where he is put to sleep so they can introduce a scope, via his mouth/throat, into the lungs. His lungs are examined and “washed” with saline. Tissue samples are taken to check for rejection. It normally takes about two days until we get the results of this test back. Like his three-month bronch, this one showed no rejection! Praise the Lord for that! It did however show that he is growing a bacteria called Pseudomonas Aeruginosa. This came as a surprise (to us)… sort of. Pseudomonas is a bacteria that Jody harbored in his old, CF lungs. Once he got it, it never went away. That’s sort of the thing about Cystic Fibrosis. They have thick, sticky mucous in their lungs and once bacteria gets in there it finds a home in the mucous and is hard, sometimes impossible, to eradicate completely. This bacteria is typically controlled with inhaled and oral antibiotics, however, when it flairs up (becomes more numerous), one experiences symptoms and is said to have a lung infection, or a CF exacerbation. Normally this calls for IV antibiotics to again lower the number of bacteria. Those of you who have been following Jody’s journey before transplant know that he has spent his fair share of time in and out of the hospital fighting these frequent lung infections. In the past it became clear when Jody had an infection because breathing became a little more labored (as his lung function decreased), cough and mucous production increased, and Jody became much more tired. Those were his classic signs that it was time for another hospitalization and IV antibiotics. We had been warned that it’s not uncommon for some of those old CF bacterias to make their way into the new lungs. It could have been sitting in his trachea (or elsewhere) when the new lungs were placed, and eventually made its way down into the lungs. Actually, we found out that a very small amount of this bacteria showed up on his three-month bronch (which they didn’t tell us at the time), but that it was too small to treat. Now, three months later, it’s grown to a quantity worth treating. We were surprised to hear of this infection because Jody feels great; breathing is good, he has no cough, no mucous, and no drop in energy. He has none of the “classic” signs of an infection that we’ve grown so familiar with identifying. I guess that’s the beauty of new lungs. In case you’re wondering, this does not mean Jody’s CF has returned. Thankfully, this cannot happen. Jody will never again have Cystic Fibrosis in his lungs. This means that he no longer has that thick, sticky mucous which bacteria love so much. He should be able to get rid of the infection completely (yeah!). He is treating with oral and inhaled (nebulized) antibiotics for three weeks; no IV’s, no hospitalization! Here is a picture of Jody after the bronchoscopy, still a little drowsy from the anesthesia. I share this photo because even though he’s in and out of sleep, you can see on the monitor, if you click on the photo (middle number in blue) that his oxygen saturation is at 99% on room air (no oxygen). Seeing that never gets old! Aside from the infection, the latest issue we are dealing with is the possibility of Jody haven broken the internal wire holding his sternum (chest) together. Over the last week or two he’s been noticing pain in the center of his chest, that feels shallow, like somethings rubbing. In certain positions he moves he can hear a “popping” sound. These signs point to a fractured internal wire. Next week we have an appointment for a CT scan of his chest which will tell us if our speculation is correct. Like us, your next question might be, how will they fix that? Honestly, we’re not really sure. 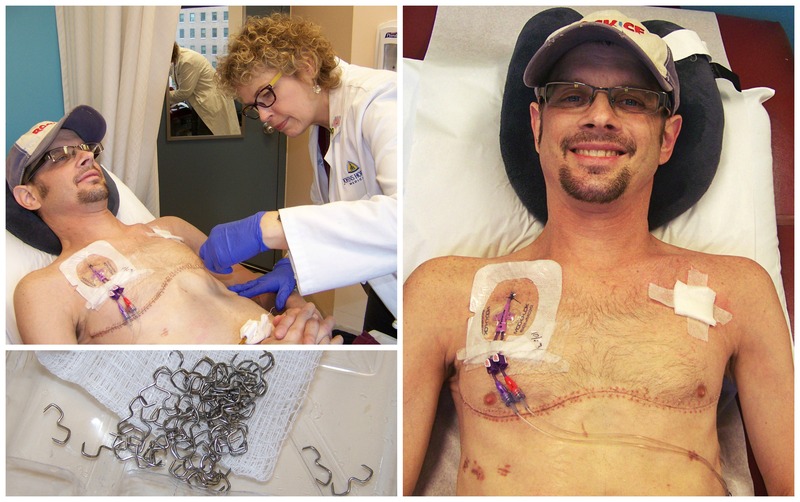 When Jody asked his transplant coordinator this question, her response was, “I don’t want to tell you because I don’t want to give you anxiety.” This response produces almost more anxiety because it sounds like the fix for broken wires is pretty ugly. Of course, I imagine the worst; having his transplant incision opened to remove or replace the wires, needing chest tubes, needing the thoracic epidural again, pain issues, etc.. Most likely it won’t be that bad, but it would have been nice for the coordinator to give us a better answer. Who knows, maybe the wires are perfectly intact and there’s another reason for the pain. As always, I’ll keep you updated as we learn more. We appreciate your prayers about the infection and the possible broken wires. Today is March 15th. 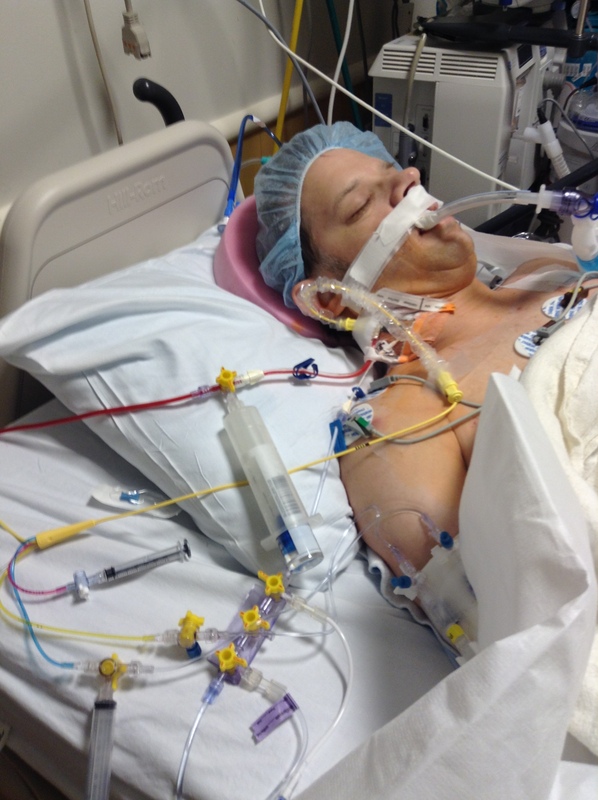 Six-months ago today Jody underwent one of the riskiest, most challenging surgeries that can be performed. His life was placed into the hands of a talented surgeon, a team of knowledgeable anesthesiologists and a room of OR staff. He was ultimately protected by The Great Physician himself. A half-a year, 26 weeks, or 182.5 days ago, Jody was quite literally given the gift of life; he received a double-lung transplant! The road since transplant has not been without its challenges but things are looking up. 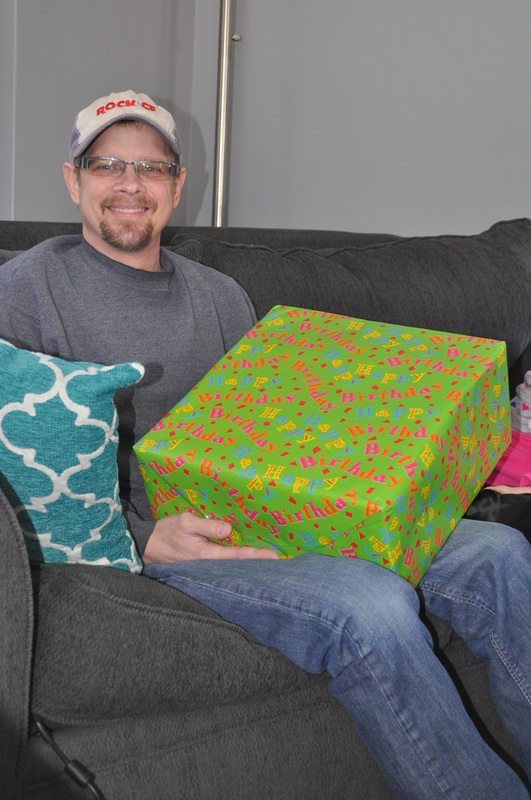 Miraculously, Jody has avoided all the nasty stuff going around this winter and has not seen the inside of a hospital room since the day he was discharged from his transplant stay (October 21st). Actually, this is the longest span of time that he has gone without being admitted to the hospital in over a year, maybe even two. We’re so accustomed to him being in the hospital every two or three months (sometimes even more often) that it seems odd to have gone six months without it. Could it be that he might go an entire year without being in the hospital?!?! As healing continues, Jody has been enjoying the life of the rest of us, one where breathing comes naturally. He can climb the steps to our second floor without needing to sit down and catch his breath at the top. He can laugh freely without it turning into a 10 minute intense coughing fit. He can spin and dance with our daughters without huffing and puffing and getting tangled in oxygen tubing. These are simple things but in life they make up the big things. These are the things we learn to really appreciate when they don’t come so naturally anymore. The ability to inflate a balloon using his new, properly functioning, air-filled lungs. Having his central line removed after five months, which means he is finally free of all lines and tubes on his body. 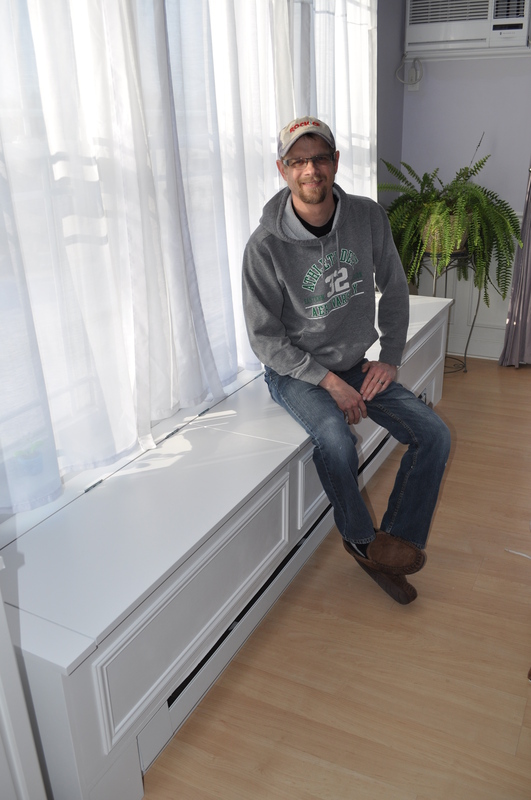 Getting back in his wood shop and building us a custom window seat with lift tops for storage. (How wonderful it was to hear the sound of his power tools and to smell the old familiar scent of fresh-cut wood). Six months ago Jody was sick. On the outside he looked healthy, but on the inside he was struggling to do something so innate, so natural… breathe. There’s no telling how long Jody would have lived had it not been for the selfless gift of a heartbroken family. To them we will be forever indebted. 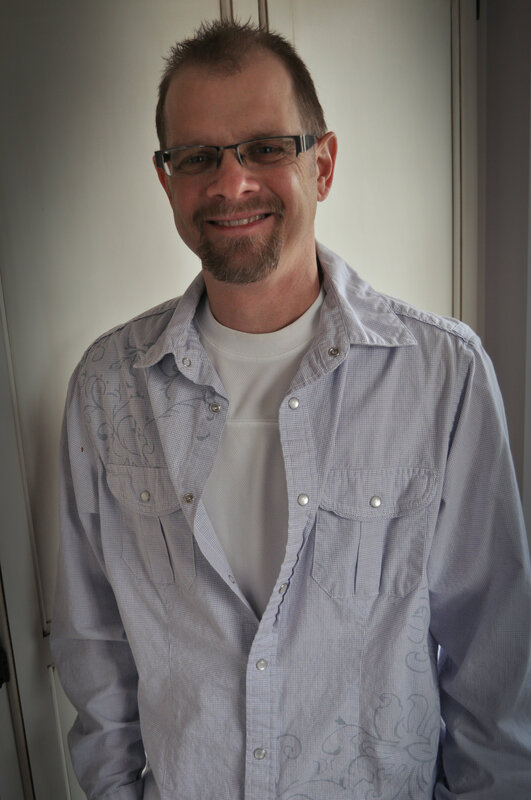 This is Jody today… double-lung transplant survivor, living, breathing, and enjoying life! Today is the day Jody has been dreaming of for the last four months! Why, you ask? I’ll tell you… if you keep reading. Many of you have noticed that I’ve taken a break from blogging and I’ve been increasingly questioned about this. I’m touched that so many of you enjoy reading my posts and take interest in knowing how Jody is progressing in his transplant journey. In this post I’ll do my best to give you an update on how things are going, but I warn you, it’s likely to be a long one. “Cytomegalovirus (CMV) is a common virus that can infect almost anyone. Most people don’t know they have CMV because it rarely causes symptoms. However, if you’re pregnant or have a weakened immune system, CMV is cause for concern. Anti-viral medication, handled like a chemo drug. It amazes me that so many CFer’s test negative for this virus because it seems they so easily catch everything else. Regardless, because Jody was so immunocompromised fresh out of transplant and his team did not want him to get the CM virus, he had to take this IV infusion for three months, stopping mid-December. At that point he converted to a pill form which won’t necessarily prevent him from getting it like the IV did. It is likely that he will contract this virus at some point in time, as most people do, so he is tested routinely for the virus so it can be caught and treated early if and when he does get it. 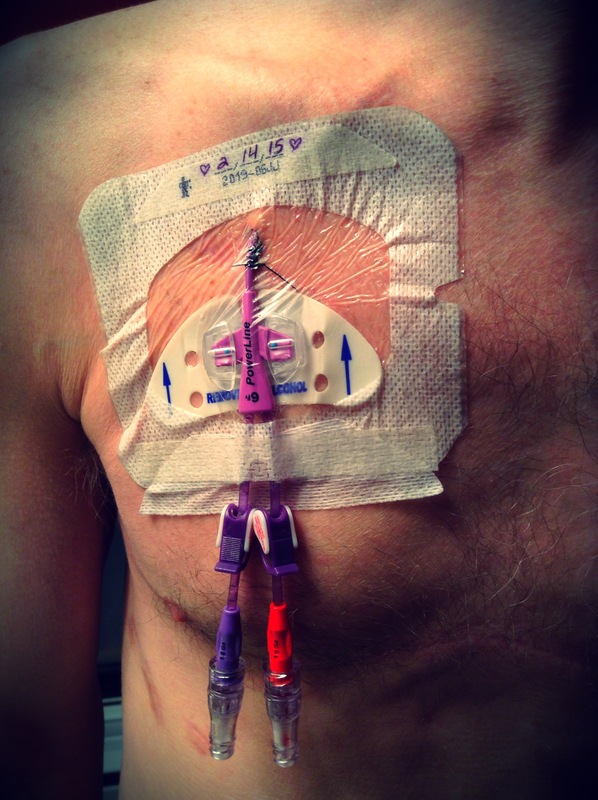 Jody is no longer on IV’s but he does still have his Hickman catheter in his chest which he flushes daily to maintain patency. 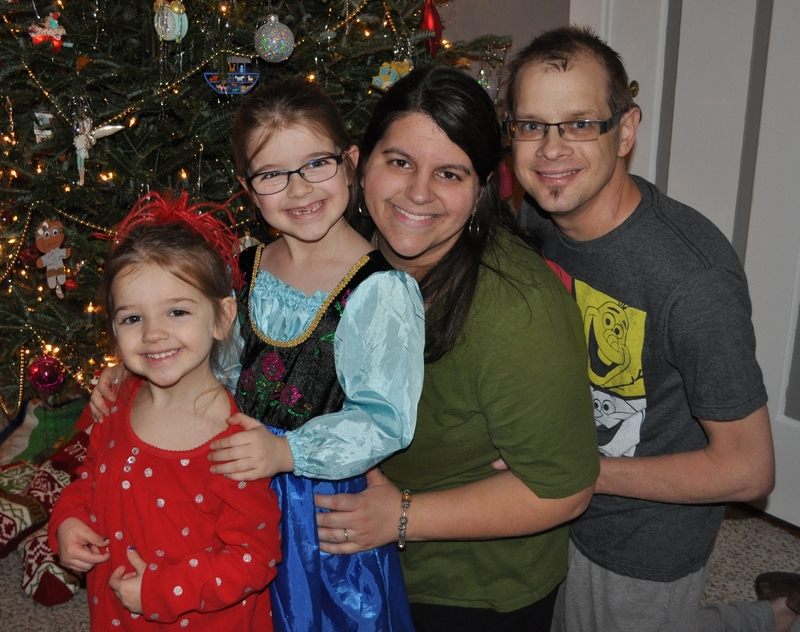 In December our family enjoyed a simple and quiet Christmas at home, just the four of us. One thing that was missing this year was a 30 foot oxygen line, getting stepped on and yanked beneath the presents and wrapping paper. It’s absence was welcomed. 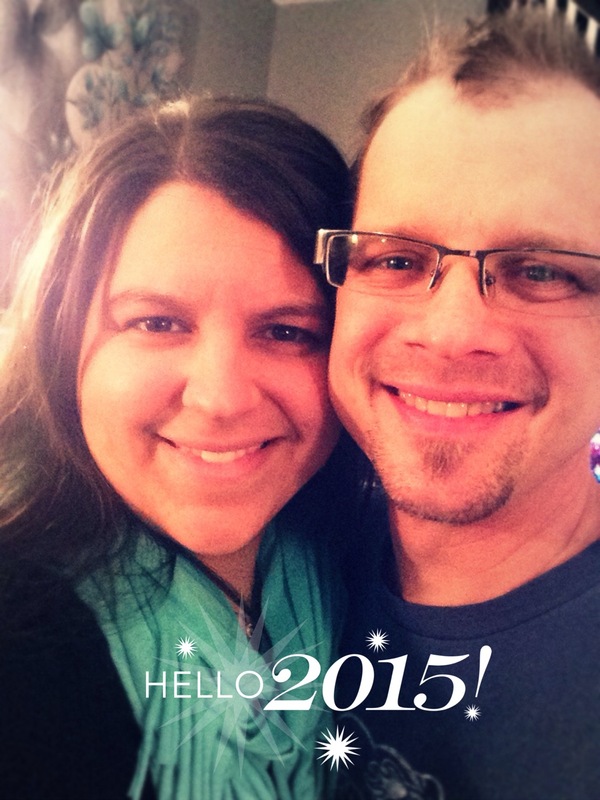 In January we celebrated the arrival of the new year with hope that it will be one of healing and change; healing from the last three years of our lives and change as our lives become (ideally) a little less dictated by disease and sickness. For two years, and especially this past year, we have felt held back and it’s great to feel those reins being loosened. Jody is now four months post double-lung transplant and since my last post he has continued to improve. He is still participating in pulmonary rehab three days a week, and his lung function is still climbing. It’s incredible, and crazy and wonderful! I wouldn’t doubt Jody will soon hit 100% lung function! His breathing has never been better! Jody’s anti-rejection medications come with many side effects and we are still working to manage them. His blood pressure, which had been high for months following transplant, and was unchanged by an anti-hypertensive drug, is now much lower after the addition of a second blood pressure medication. The steroid he is on is being tapered down toward the maintain dose he will take for life. Each time his dose is lowered his blood sugar levels improve. It is possible that he will be one of those few people who will not be (medication induced) diabetic for life. We hope that once he reaches his maintenance dose of Prednisone he will be able to stop checking his blood sugar and injecting himself with insulin. How great would that be?! Jody seems to be very sensitive to his Tacrolimus, one of the anti-rejection drugs. His desired blood Tarco level is between 12-14. This is the range where the drug is most therapeutic for him. His levels seem to be jumping all over the place, going low at 11 or high at 16. His dose keeps changing and we have yet to find the perfect fit that keeps him steadily in his desired range. It’s odd that even on the same dose his numbers fluctuate so much. This drug is hard on the kidneys and Jody’s kidney function is definitely showing signs of impact from it (and other) medication, especially when his Tacro levels are elevated. This is a little worrisome to me, a once nephrology nurse, especially knowing that it’s not uncommon for lung transplant patients to eventually need a kidney transplant as well. Jody’s kidneys have taken a beating through years of potent antibiotics, toxic levels of drugs, and other necessary medications, known to be taxing on these hard-working organs. Obviously we pray healing and protection over Jody’s kidneys. Overall things are going really well. 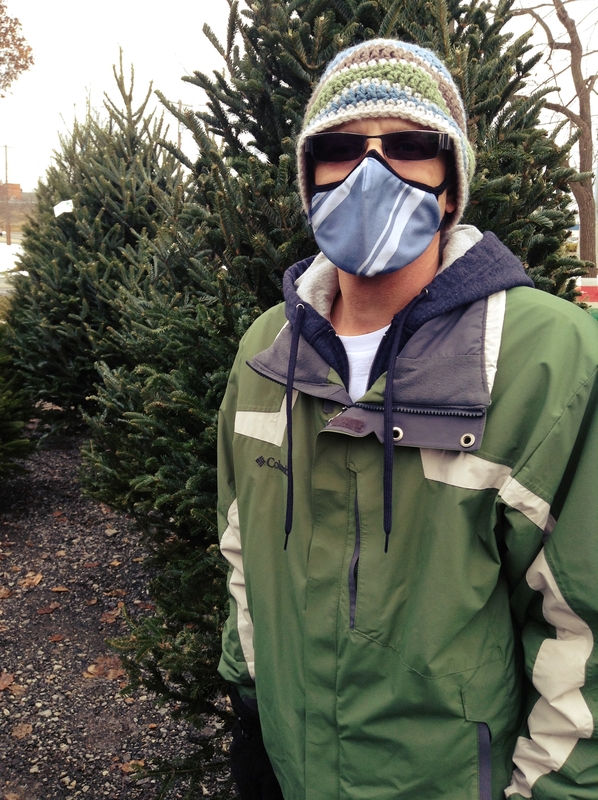 Jody is breathing independently and enjoying life… cautiously… after all, it is still cold & flu season. 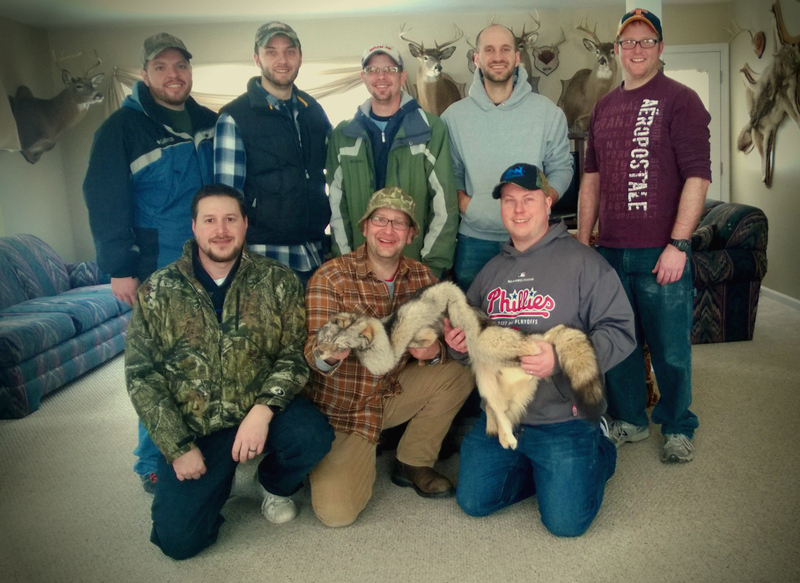 This month he even got to enjoy a fun ‘guys’ weekend away with some friends, something that would have been near impossible a few short months ago. 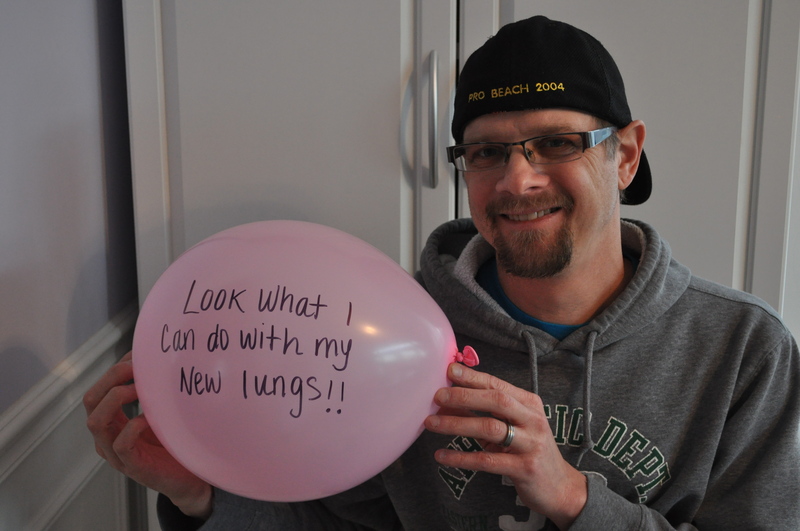 His new lungs are AWESOME and we remember with gratitude, the person/family who gave them to him. As I mentioned in the beginning, today is the day Jody has talked about for the past four months. Today is the day he got his feeding tube taken out!!! He has hated that thing since the day it went in. It was put in out of necessity, he hadn’t been allowed to eat for over a week. Actually, he probably only ate a week and a half out of the five weeks he was in the hospital. I’m glad for the nutrition this tube provided him during that time, but since coming home, and being given the okay to eat, the tube hasn’t been used (with the exception of daily flushing to clear the tube). At discharge Jody weighed 100 lbs, today he is 124. Thank you to the many of you who brought us delicious meals, you played a part in this much needed weight gain. You might be wondering why Jody’s feeding tube has stayed in this long if it hasn’t been used for the last three months. Steroids impair healing and because Jody was on such a high dose, his feeding tube hole might not have closed had they taken it out three months ago. Picture him taking a drink and it immediately coming out his stomach (we’ve seen videos of this). Each month the doctors have lowered his steroid dose and he is finally at a level where they feel his tube can be pulled without complications. This is great news because the tube has caused Jody great discomfort. It is now gone, leaving Jody with yet another scar, proof of all he’s endured on this journey. Jody’s has now been approved for monthly clinic visits. It’s so great to be spending less time at Hopkins. Sometimes he still has appointments there for other reasons, like today, but it’s great to have his transplant appointments less frequently. For the past year (or more) we’ve been going to Hopkins at least monthly, often even more frequently then that, so I can hardly imagine what it will be like when Jody’s appointments become even more spaced out. To put Cystic Fibrosis and transplant on the back burner of our lives again seems dreamy. I warned you this might be a long post. I’ll end by asking for your continued prayers for protection over Jody during this tough cold and flu season. Ironically the girls and I have gotten colds (we have them now) but we’ve managed to keep them from Jody (so far). Our family has avoided the stomach bug and flu that has been spreading like wildfire. We’ve been warned about how any of these might impact Jody, and would prefer to avoid them (and another hospitalization) altogether. Thanks again for reading and for your continued care and concern for Jody. On Saturday he will be celebrating his 43rd birthday… out of the hospital, breathing great and healthy. One couldn’t ask for much more than that! Three months! That’s how long Jody has had his new lungs. In some ways it seems like it was just yesterday when we received that much-anticipated phone call, and in other ways it feels like a lifetime ago. Who knew ones life could change so drastically in such a short period of time? This past week I began reflecting on some of this and am only now realizing just how sick Jody was before his transplant. Infections, hospitalizations, shortness of breath, oxygen tanks, doctors appointments, limitations; they were our norm. I had forgotten what it was like to live a life not dictated by disease. I grieved the lives we once lived before CF took over, but at the same time, the longer we lived that new life the more I became comfortable with it and it felt like normal (even though I knew it wasn’t). I’m only now realizing just how much I subconsciously worried about Jody during this period. People living with Cystic Fibrosis take their final breath each and every day, often not making it to the point of transplant. I’m SO grateful to the team of people who took care of Jody during these years of decline. I’m thankful for the way they valued his life and cared about him as well as for the wisdom they displayed in knowing the right time to start the transplant process (even though at the time it was a scary and overwhelming option). Thank you, Lord, for placing these people in our lives. Over these last two years Jody has had to give up many responsibilities around the house as simple things, such as going up the stairs, became work in and of itself. Jody was not happy to give up a lot of these things, nor was I always (or ever) happy to have these responsibilities added to my ever-increasing work load. I can think of multiple times this past winter when after working a 12 hour shift I came home to our large driveway, full of snow, and knew I would be responsible to remove it. This was the last thing I wanted to do after a long and tiring day. I felt grumpy and irritated with the situation and missed Jody being able to help out with these things. 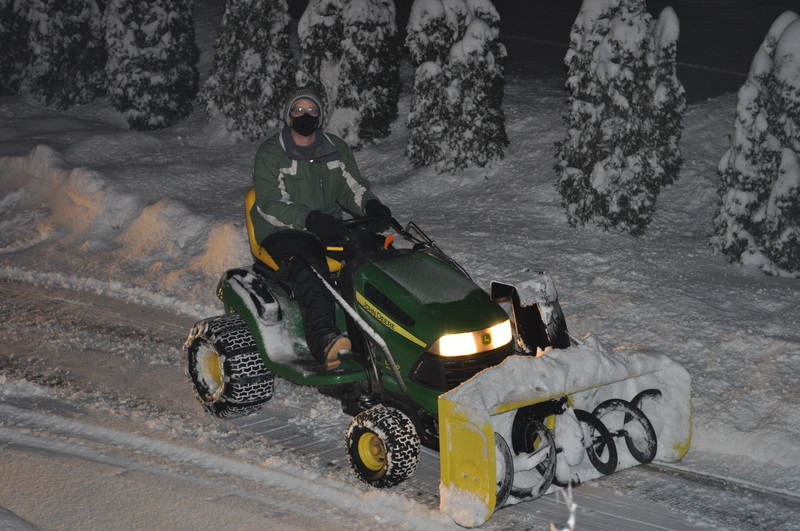 He, on the other hand, felt grumpy and irritated that he had to watch me (from inside the house) having ‘fun’ on our riding mower, snow blower attached, as I cleared the driveway (although I wouldn’t have called it ‘fun’). Things like taking out the trash each week, filling the gas tanks in our vehicles, mowing the lawn, grocery shopping, running errands, laying our girls down for naps, or checking on them when they needed something or were being naughty (because those things required going up stairs), are just a few of the things Jody gave up. I share this with you because three weeks ago I came home from work one afternoon (on trash night) and before I even pulled into our driveway I immediately noticed the trash cans sitting there, ready and waiting for pick-up the next morning. It was a simple task with huge implications, and I was struck by it. Jody is getting his life back! The weight I have carried for so long is slowly but surely being lifted. I am getting my helper back! Despite the fact that things are going really well, I’m finding that it’s hard to give up something which had become so engrained in me. It’s odd not to rush Jody to the car when we go outside in the cold, to let him go check on the girls upstairs, to send him out to pick something up at the store. I have carried so much guilt for not being able to do enough and for making Jody do things that he probably shouldn’t have been doing, like taking care of our girls while I worked. Any time my work phone rang and displayed a home number I found myself holding my breath and almost afraid to answer, fearing something was wrong (because sometimes it was). Jody has never been a complainer but I knew his job as stay-at-home-dad (forced on him by disease progression) was not easy. How could it be with 22% lung function? It’s wonderful to share with you how much two new lungs have changed our lives. Jody has more energy than I have seen in years. I can leave for work in the morning without guilt because I know that he is more than capable of caring for our children while I am gone. When I come home I hear stories of all the fun things they did that day and I smile and think to myself how thankful I am for organ donation. There is so much more I could share with you in this post about how our lives are changing (and it’s only been three months). I don’t feel like I’ve done a very good job of expressing the change in mindset CF and transplant have played in our lives. It’s hard to put into words the way I feel in my head and heart but hopefully you have somewhat of an understanding of this. Just as it took time to adjust to the ‘loss’ of life as Jody’s CF progressed, so too will it take time to adjust to this rebirth of life (although I think this will be less of an adjustment since we’re gaining rather than giving up). While I believe Jody will beat the odds of transplant I feel cautious to jump in with wholehearted belief that this positive change in our lives is here to stay. Having given up so much in the name of disease it somehow seems easier if I keep myself prepared for the worst. I don’t know if you could call this being guarded or just being realistic? Conversations like we had this week in clinic about hospitalizations and viruses, especially those which can cause a rapid, drastic decrease in lung function do not make it easier for me to believe this new life is here to stay. Regardless, the changes I am seeing in Jody right now are amazing! Now for a brief medical update. 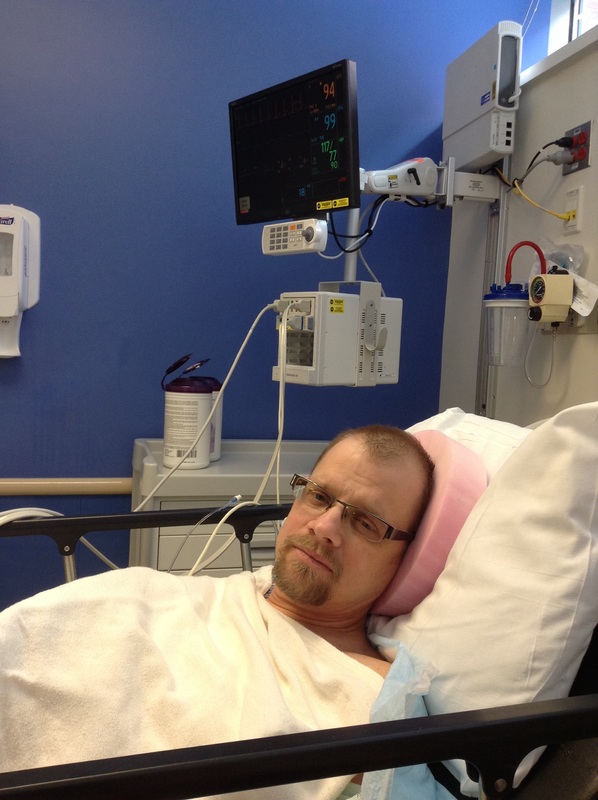 Last Friday (12/12) Jody had a routine three-month bronchoscopy done. He was put to sleep for this procedure so a scope could be inserted through his mouth and into his lungs. They were then ‘washed’ and checked for rejection and infection. I am glad to report that he has neither of those! Additionally, the damage that was displayed after Jody’s aspiration in the hospital has been resolved. One more good thing to share… Jody’s lung function this week hit 91.4% (and that’s after the bronch when doctors expect to see a temporary decrease in function)! He wanted to hit 90% by Christmas and he did. We praise God for all these good reports and are cautiously optimistic that they will continue. I’ll end with a photo collage of a family outing we recently took to Dutch Winter Wonderland, a local amusement park for kids. These tickets were gifted to us and would not have been possible if it weren’t for Jody’s new lungs. It has been a long time since we did something like this and we look forward to many more of these outing where precious, lasting, memories can be made. 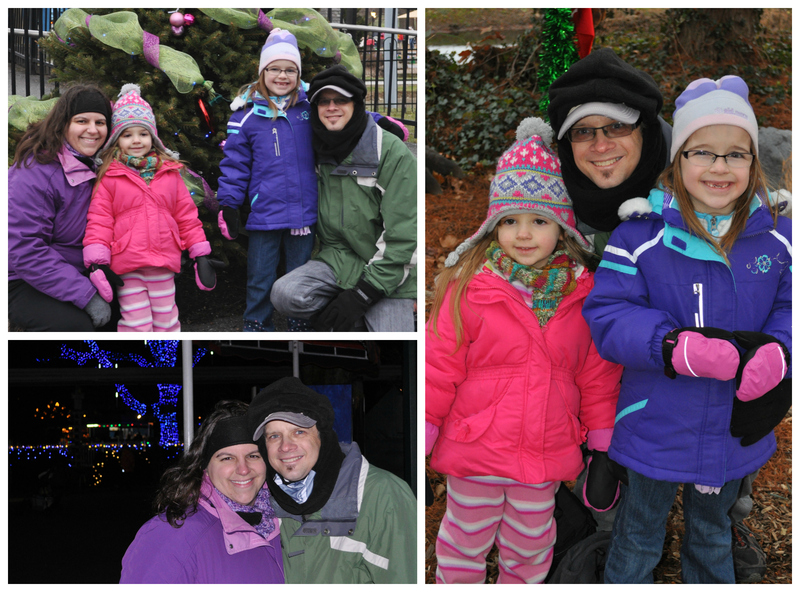 Family Fun @ Dutch Winter Wonderland. I can hardly believe we’re entering the second week in December. I think I’m going to blink and realize that Christmas has come and gone. Last week we went out and bought a real tree (which we had approved by the transplant team). 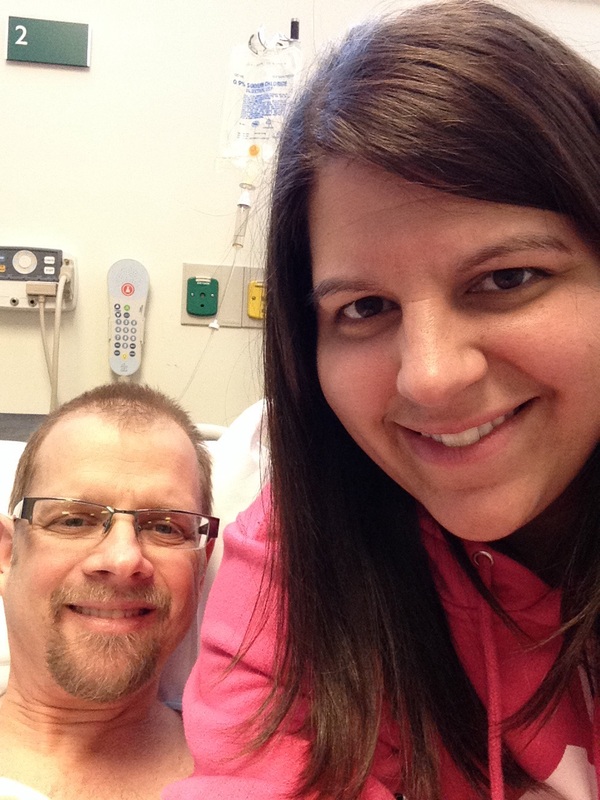 Pre-transplant, the cold weather was very bothersome for Jody. As soon as he breathed that cold air into his failing lungs it caused his chest to tighten and elicited lots of intense coughing. So much so that sometimes it even caused bleeding in his lungs. Last winter I dreaded every time he stepped outside. Few things scared me like the site of him coughing up bright red blood, standing helpless, waiting and wondering if and when it would stop. People with CF have died from this alone; it can be very serious. I used to tell Jody to wrap a scarf around his mouth and nose, I’d tell him to go straight to his seat (I’d buckle the girls into their car seats), and sometimes we’d even use his handicapped sign to park close to an entrance so he had less exposure to that cold air. Often he needed to do an Albuterol nebulizer treatment after being outside to help open up his airways, relieving some of the chest tightness. There are so many things we take for granted in life, like being able to go outside and breathe comfortably and effortlessly. This winter is going to be different. While I’m scared of the fact that it’s cold and flu season (and I’ve been warned that Jody could be admitted 10 times this year for various bugs and infections), I feel such peace knowing that he can walk out the door and breathe well. No longer do I fear him coughing, no longer do I dread the site of blood spilling from his mouth. It’s odd to not hear his cough anymore… but it’s wonderful too! All that to say, aside from being cold, our hunt for the perfect Christmas tree went well; no oxygen, no shortness of breath, no coughing, no blood, and one perfectly green, perfectly fragrant six-foot Fraser fur. Jody continues to make great progress, and his PFT’s are still climbing. Last week at clinic he was up to 85.4% lung function. Oddly, just two weeks after being lectured for driving and told that he wouldn’t be allowed to drive for six months, he was given the okay to drive again. We don’t pretend to understand what changed their minds, nor do we question the decision since Jody feels ready and it will make our lives easier to have two drivers in the family again. I have been back to work for about 2-3 weeks now and it has not been easy. People ask me all the time how Jody is doing, and I appreciate that, he’s been through a lot and deserves to know that people care about him. Unfortunately, that’s normally where the conversation ends. Very few people ever think to ask how I am doing, really doing. These past three months (nearly) have been anything but stress-free. We’re finding that Jody has very little memory of his five weeks spent in the hospital which, for him, is probably for the best. I on the other hand have full recollection of it all, including things that I have chosen not to share on my blog. I’ve had very little time to process all of this as I have lived on survival mode. The weight of ‘single’ parenting, care giving, working to provide for my family, housekeeping, chauffeuring, arranging babysitters and doctors appointment after appointment are heavy upon my shoulders. Nearly every day off work is spent at some kind of appointment. I have adjusted my work schedule when I can, working all kinds of shifts to lessen the need for sitters, at the expense of sleep. Work in and of itself has been stressful lately with census surges and less than ideal staffing. Jody and I have had very little quality time together since transplant and I’ve spent little time with friends and doing the things I enjoy. All of this has taken its toll on me. This entire experience, including the two years leading up to transplant, has certainly changed me. I’m overjoyed with how well Jody is doing with his new lungs and words can’t describe how thankful I am for this gift, but just as it’s been hard on him it’s been hard on me too. I’m dreaming of a relaxing vacation, just he and I, where the ocean is clear, the sand is white, and his scar is faded. It will be a long time until this dream comes to fruition but I trust that one day it will, after all, isn’t that the point of this transplant, to enjoy life, to make dreams come true? We may not be reaping the full benefits of Jody’s new lungs yet, but I know we will. I know that my stress level will decrease, and one day (hopefully soon), life will be ‘normal’ again. Until then, I continue to put one foot in front of the other and press-on. Just like Jody, I’m a survivor! Jody is doing well. Really well. On November 15th he reached the two month mark, and I have to say, his new lungs are downright awesome! Each week at clinic his lung function continues to climb. This past week he was at 81.5%! I can hardly wrap my brain around this considering a few short months ago he was down to 22%. Can you imagine what that must feel like? Recently I looked at my records of Jody’s PFT’s from when we started dating 10 years ago (yes, admittingly I do have 10 years of records in my file cabinet). In 2004 his lung function was hanging around 75%. Through the next ten years he experienced a slow and steady decline until his lungs nearly gave up here in 2014. One night in surgery erased 10 years of damage. It’s crazy! Pulmonary rehab is going well and Jody is definitely becoming more active. In fact, this past week in clinic he was reminded not to overdo it because he has a very thin wire holding his chest together right now. Jody has a transverse sternotomy incision which means they cut his breastbone in half horizontally instead of up and down. 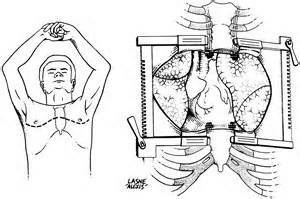 This provides greater access for a lung transplant surgeon than the traditional (vertical) sternotomy. I searched online to find a photo of this to give you a visual and this is the best one I could find (sorry it’s a little blurry). On x-ray you can see the bow tie-like wires holding Jody’s sternum together until it heals. Until that time he continues to have lifting and stretching restrictions. Speaking of restrictions… two weeks ago his transplant coordinator gave us the impression that he could start driving when he felt up to it, and recently he did. After two months of me, and only me, at the wheel it was great to have him back at it… he could drive himself to rehab. At clinic this week he was given a lecture about having started driving and told that he wouldn’t be cleared to drive until six months out of surgery. The coordinator (who seems to call the shots) did correct the doctor and say that it wouldn’t be that long. It was frustrating to be given this gentle scolding when just two weeks ago Jody was told that he would know when he felt ready to get behind the wheel. Perhaps they should have clarified that just because he felt ready didn’t mean he was ready. So now we’re back to me and only me behind the wheel. This is complicated because I am back to work, Jody has rehab three days a week and our youngest daughter needs to get to and from preschool three days a week. Jody’s clearance to drive couldn’t come soon enough. 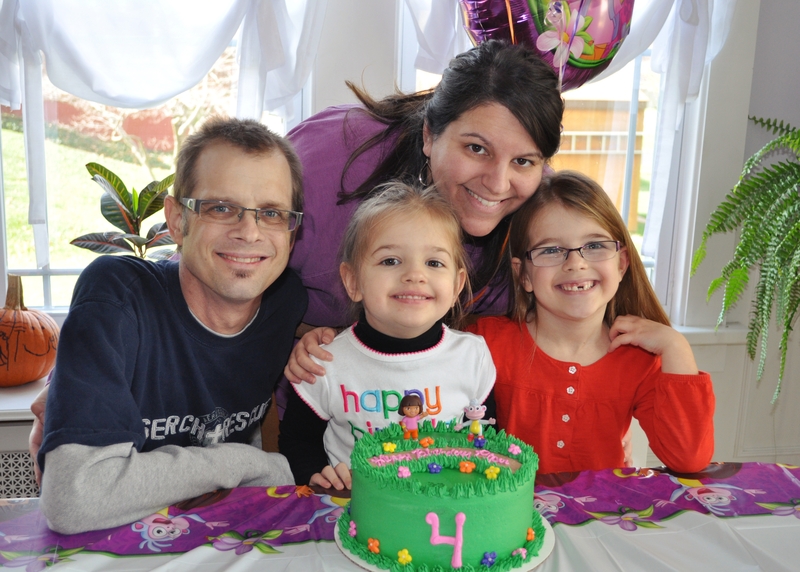 One thing Jody’s new lungs allowed us to do recently was to celebrate our youngest daughter’s fourth birthday. We didn’t do anything fancy, just the four of us here at home, in fact, I didn’t even make a cake, I bought one (gasp). Most of you know that one of my favorite things to do is make/decorate fun birthday cakes for our girls but this birthday I decided I didn’t need the added stress. Piper, forgive me, I promise I’ll make it up to you next year. 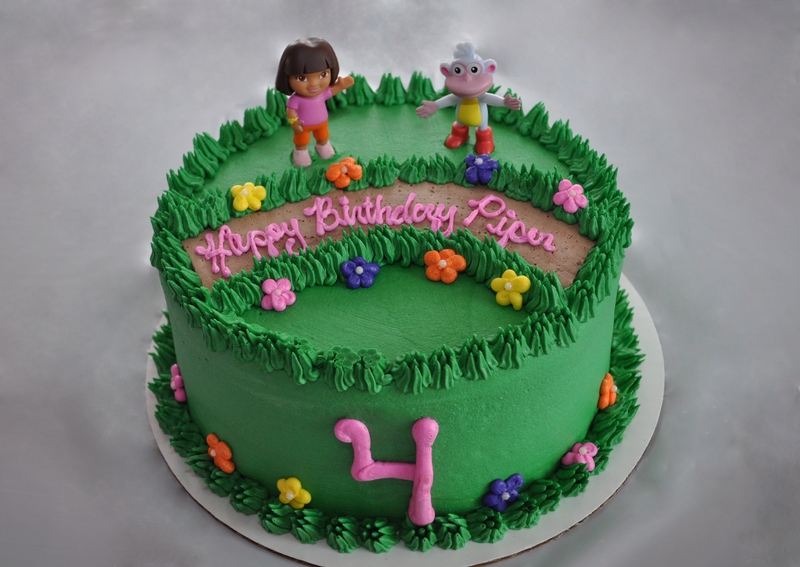 The cake I asked the bakers to make turned out cute and she probably didn’t even care that it wasn’t made by me. Do you remember this post, ‘Thank you, transplant, for waiting two more days?‘ I guess I could have titled this one, ‘Thank you, transplant, for this day.’ I’m so glad our daughter didn’t have to celebrate her birthday without us. The hope of this transplant is that Jody will thrive, beating the statistics of lung transplants just as he beat the odds stacked against him so many years ago when he was diagnosed with Cystic Fibrosis. Hopefully he will be around to celebrate many more birthdays. One final note, our family received some sad news this week that Jody’s Mom, Sharon, was diagnosed with colon cancer. She has an appointment with a surgeon in two weeks and until then we are left with very little information on the staging of her cancer and the treatment plan. We know she will have surgery on December 10th and we appreciate your prayers for that. Thankfully I am off work that day so I can be there for her surgery. Pray that God would fill her with hope and minimize the negative thoughts that come with every cancer diagnosis. Thanks for continuing to follow Jody’s Journey. All things considered, Jody had a good week. He’s eating well (many thanks to the people bringing delicious meals), he gained a pound, and he was even a little more active at home. On Monday he had a local speech therapy session where they taught him additional exercises to strengthen his swallowing muscles. It seemed kind of pointless because he had already been practicing the strategies he learned while in the hospital and on Wednesday he completely and totally passed his sixth swallowing study. He no longer needs to use his adult ‘sippy’ cup, he can drink without fluid restrictions, and he can eat foods of mixed consistency (like cereal with milk, or soup). At this point he is still taking his pills with Jell-O or pudding, but he’s been cleared to take them with water, just one at a time. Jody was very excited to have passed this test. I’m glad too but feel a little cautious after everything we’ve been through. At clinic on Wednesday Jody’s PFT’s were 73%!!! One week ago they were 64% and the week before that they were 50%. It’s mind-blowing! This past year watching Jody’s PFT’s had become something I dreaded, they were so disheartening, and a little too much reality that his lungs were failing. Now, with two healthy lungs which are getting used to their new home, his PFT’s are not so depressing. In fact, they’re actually uplifting. Watching those numbers climb is confirmation that transplant was worth it. We hoped for this. We prayed for this. It hasn’t been easy, but we thank God for this gift. There is a reason people refer to organ donation as ‘the gift of life’… because it is… truly. I may not speak of it often, but we have not for one day forgotten Jody’s donor and his/her family. Also at clinic this week Jody lost his metal! If you’re not following me, I’m talking about his staples… all 67 of them. After seven weeks his incision had healed well enough and the staples were ready to be removed. It was simple and painless, and now he has one less (or 67 less) things on his body that don’t belong there. The day he gets his feeding tube and central venous catheter out will be another day to rejoice. Because Jody was not on enough medication (enter sarcastic tone), he was started on five new meds this week. The most notable one is a medication to lower his blood pressure, which has been elevated as a result of his immunosuppressants. To help with his high blood sugars we’ve started giving him four extra units of insulin on top of the sliding scale at breakfast, lunch, and dinner. Remember that unlike ‘normal’ diabetics he doesn’t need to limit his sugar intake (because of his Cystic Fibrosis). For now this increased insulin seems to be working. Jody was not diabetic before transplant and it is still possible that once his Prednisone dose is tapered down (currently he is on 17.5 mg), his sugars might improve. However, this could also throw him into full-blown diabetes. Time will tell. Obviously our hope is that he will not be diabetic for life. As you may have noticed, there are so many side effects to the medication Jody is required to take. I just mentioned high blood pressure and high blood sugar, but it doesn’t stop there. The Tacrolimus causes his hands to shake noticeably. Our oldest daughter has asked more than once, “Daddy, why are your hands shaking so much?” These shakes even render his handwriting illegible. We are told that with time his body should adjust to this medication and the shakes may be less. Jody still has blurred vision (although not nearly as bad as in the hospital), and this past week we noticed his speech was off. When we mentioned the speech thing at clinic the team didn’t seem to have an answer for it or to be concerned by it. Anyone who knows Jody can pick-up on it pretty quickly. It’s hard to know what could be causing it if it’s not a known side effect of his medications. I guess we’ll just keep an eye on it and pray that it resolves with time. Friday Jody started his first pulmonary rehab session. This is done locally and actually he was doing this at the same center pre-transplant. Then it was to preserve the lung function he had, now it’s to improve it and get him back into shape. Pulmonary rehab is basically guided exercise. Jody is very deconditioned right now so he is looking forward to rehab and the strength it will give him.